The Consul General of France in New Orleans, Gregor Trumel, tours Poverty Point and north Louisiana on Wednesday. Trumel will get a first-hand look at the World Heritage Site near Delhi, in a visit organized by Lieutenant Governor Jay Dardenne. Later in the day, Trumel attends a ceremony in Shreveport, where he will bestow the French Legion of Honor Award to three American World War II veterans. The ceremony takes place at Centenary College. 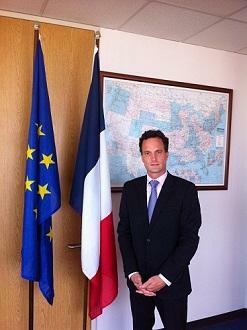 Trumel was appointed by French President Francois Hollande last summer. This will be his first trip to north Louisiana. The journey of Acadians across the globe is documented in Warren and Mary Perrin's new book, Acadie: Then and Now, A People's History. The couple researched the Acadian population for the past three years. Their stories and discoveries highlight the resolve and commonality of the culture wherever people have settled. Mary Perrin describes the book as an encyclopedia of Acadian and Cajun culture. Warren Perrin says preserving the French language is critically important to carry the Acadie heritage to the next generation. The Louisiana Department of Insurance has enhanced it's online tool to help consumers find a better rate for homeowner and automobile coverage. "You can enter more specific information about yourself and miles you drive, and other things that set rates," Donelon said. The upgrades include streamlined online services and a responsive design that makes the site compatible with mobile devices. He says policy holders should be aware that scenarios presented in rate comparisons are for illustrative purposes and are not designed to match exact circumstances.